It’s interesting how so many people keep refering to the new health insurance bill as “health care reform.” For all the good things it does, it doesn’t reform health care so much as it reinforces profit-driven medicine. Like many other holistic health professionals, I believe that any real health care reform must begin with broadening our understanding of health itself. For health is much more than the absence of sickness. It is a process – a way of being, if you will. To borrow a phrase from [former Health, Education and Welfare] Secretary Califano, we’ve become a “sick-care system” that puts all its efforts in developing newer drugs and offering more surgery once a person is ill. Doctors are not trained to keep people healthy. They are also strongly tempted to perform needless procedures that do not extend life span, such as hysterectomies, lower back surgery, heart bypass, and balloon angioplasty. We are addicted to the sick-care system, and no money is being allocated in any of the reform bills in Congress to breaking this addiction. Massive public education was successful, over a long period of time, in getting people to quit smoking. Now we need the same massive public education to get them to adopt prevention. Will doctors, insurance companies, and big pharma do the job for us? Well, did big tobacco do the job of ending smoking? Without government action, the private sector will push drugs and surgery because prevention doesn’t show up as profit on their bottom line. Sad to say, but mainstream dentistry has a pretty bad track record when it comes to privileging sick care over preventive care. I suspect that much of it stems from the long-standing idea that dentists are little more than “glorified mouth mechanics,” as biological dentist Gary Verigin once put it. They see the mouth in isolation from the rest of the body and serve mainly to fix things when they go wrong: filling cavities, performing root canal procedures, repairing broken teeth and so on. This view has made it easy for some to accept many practices that we now know to be harmful yet still continue to be done. They put mercury fillings into decayed teeth. They soak the teeth and gums in fluoride. They do root canals in a misguided effort to “save” dead teeth (Would you keep any other organ in your body if it were dead?) and in the process create harbors for infection that even just the normal pressures of chewing can push into the body’s circulation where it can wreak havoc elsewhere. The first step in dental health care reform is to stop these practices that put individuals at risk of illness, just as holistic and biological dentists have done. Deeply understanding the relationships amongst the teeth, gums, soft oral tissues and the rest of the body, they can provide nontoxic, health-enhancing care – whether it’s undoing problems caused by profit-driven dentistry or supporting individual patients in their quest for optimal health and wellness. The concerns of biological dentistry are spelled out concisely in a new book by longtime biological dentist Douglas. 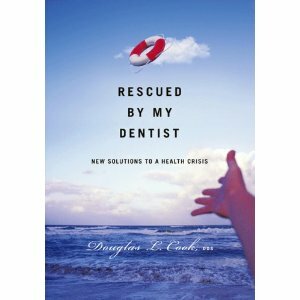 L. Cook, Rescued by My Dentist: New Solutions to a Health Crisis. Cook also spends a good deal of time outlining the concepts of energy medicine as it pertains to the teeth, especially focusing on the tooth-meridian relationships so vital to the understanding of how problems that begin in the mouth can cause or influence problems elsewhere in the body. (According to the great Dr. Voll, cited by Cook, 80 to 90 percent of all systemic health problems can be traced to the oral cavity.) In short, it offers a solid, general introduction to what biological dental medicine is all about, and the strength of that information is what makes this book valuable. One aspect of the book that may be extremely interesting and useful to the lay reader is the collection of case histories Dr. Cook has included. These amply illustrate the range of physical problems and health conditions that can be cured through proper attention to dental conditions. And while some might object to this being little more than more authoritative anecdotal evidence, the doctor does back up that evidence with reference to key scientific literature. In reading the case histories, though, it’s important to remember that cure is seldom instant, especially when health problems have been chronic for years. Yet the overwhelming majority of histories here suggest that cure came fast, typically reporting a remission of symptoms within a few days at most. While such “miracles” do happen – I have seen them myself – it must be stressed that they are “miracles” precisely because they are not the norm. Just as it takes years of negative health influences to damage one’s health, it takes time to heal, and it’s important for every person who seeks biological dental care to understand this before proceeding with treatment. Great things can and do happen, but more often than not, over time. Though the book could benefit from a really good edit – there’s a fair amount of repetition here, and sometimes the organization is less than clear – as mentioned, the information is valuable, and the main points, put across powerfully and memorably. I would not hesitate to recommend the book to patients – or potential patients – who are just beginning to investigate the possible connections between their health complaints and their dental health, as well as practitioners who want to understand what the biological approach to dentistry is all about. If they then want to know more, they can turn to the many excellent sources Dr. Cook cites, as well those I list on my practice’s website (scroll to the bottom of the page to the section “For Further Reading”).